This past Sunday local winery Dragonfly asked me for help finding a new name for their wine – as “Dragonfly” was under copyright protection with biggie Napa winery Nickel & Nickel. The catch: Keeping the art intact on the label. Specifically: the bug. They also offered a bottle of wine to whoever came up with the name they chose! I announced it on my Facebook page, to Eve’s Wine 101 group on Facebook, here in a blog post and asked readers to e-mail me at home, via Facebook or comment on my blog. I then proceeded to inundate Steve Lemley, Dragonfly co-owner with Nate Hasper, all of the names readers were sending me. They threw in the towel about 6 hours later: They were going to take all of the suggestions and make a decision. They basically made my readers cease and desist! I wasn’t ready to get off the bar stool myself, but, I had no choice. I’m just the passionate conduit; they’re the the electrical source. 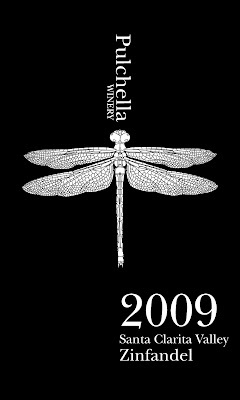 Which is just another name for the Dragonfly butterfly…that is thankfully not protected by copyright by any other winery. And in regards to the “Name that Winery” winner? Eve and readers, I want to sincerely thank you all for the amazing response we got from all of this. We truly appreciate all the support and ideas in helping us rename the winery. Eve has been a huge supporter from day one for us and we love the passion she possesses for anything wine. She does all her work purely for the love of it and that’s the same philosophy that we make our wine under. Cheers to you Eve for bringing this passion public for all of us to enjoy everyday. And to all of your readers for the overwhelming support. We hope you like the new name and hope to see you all at the upcoming SVC Wine Classic event. Don’t you just love Steve Lemley? His wines are outstanding and he just makes you want more!